There was no clear winner in the primetime race, based on the latest overnight ratings of AGB Nielsen Philippines among Mega Manila households. 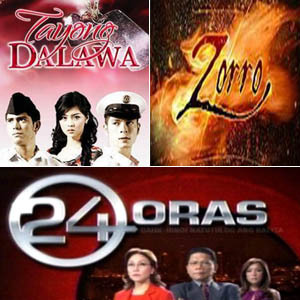 Three shows-two from GMA-7 and one from ABS-CBN-topped the primetime race the last three nights: Tayong Dalawa (July 14), Zorro (July 15), and 24 Oras (July 16). The rating of each show was so close to one another that the race for primetime supremacy in the ranking of the Top 10 shows constantly changed everyday. In the daytime race, GMA-7 was the clear winner with five of its programs taking the upper half of the Top 10 shows. These are Eat Bulaga!, Kung Aagawin Mo ang Lahat Sa Akin, Ngayon at Kailanman, Hole In The Wall, and Daisy Siete.